The Australian Open this year was quite gloomy after Nadal lost due to his injuries and Federer was forced out of the tournament before the finals. But Djokovic and Murray played the final so briallintly that people forgot to miss Nadal and Federer. 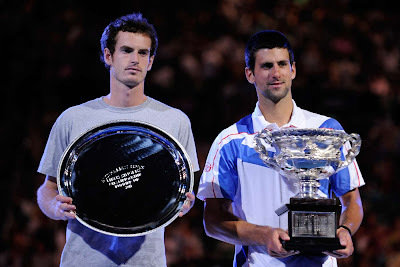 Although the British boy tried hard to beat back the Serb, but the Serb was determined to lift the coveted Australian Open Trophy – the first ever of his life. Djokovic comprehensively beat Murray is straight sets, 6-4, 6-2 and 6-3. It took him just 2 hours and 39 minutes to bulldoze any dream of Murray of a come back and restore the games slipping fast out of his racket. The defeated Murray was all praises for the Serb and said after the match that he (Djokovic) played great, although he would have liked to play better. "I think he would have beaten every other player on the tour tonight,” Murray added. Had Murray won, he would have brought an end to Britain’s 75 year drought in men’s singles Grand Slams. But Djokovic did not give him even a single easy moment to rein him. For Djokovic, a name I find very hard to pronounce, it was winning the second major championship of his tennis career. After the match he proclaimed that he felt like a more experienced player. And he was damn right in saying so. “Physically, I’m stronger, I’m faster. Mentally, I’m more motivated on the court. I know how to react in certain moments, and I know how to play on a big stage,” he continued to boast. Well Djokovic has every reason to be happy and proud as this great moment in life may be a cue for many such trophies lifting in future – only IF Nadal fails to recover from his injuries and Federer doesn’t play more maturely in days to come.